BreatheLife is a global campaign led by the W﻿orld Health Organization (WHO) in collaboration with the Climate and Clean Air Coalition (CCAC) to mobilize cities and individuals to protect our health and our planet from the effects of air pollution. I typed my city into the search box "Los Angeles" and was presented with my city as well as a couple of other nearby cities. 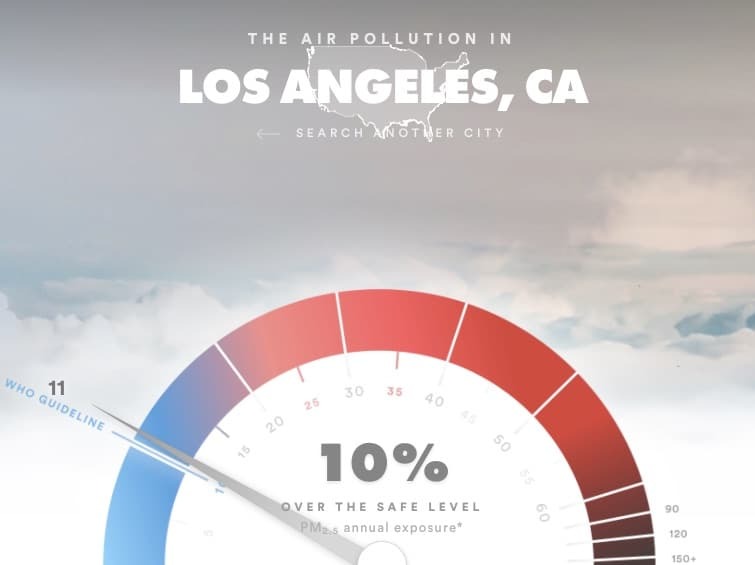 The air in Los Angeles, CA has an annual average of 11 µg/m3 of PM2.5 particles. That’s 10% more than WHO safe level. The air in The United States has an annual average of 8 µg/m3 of PM2.5 particles. That’s 20% below the WHO safe level. The data featured on BreaheLife comes from WHO’s Global Platform on Air Quality and Health. This includes an urban air pollution database with monitoring data collected from 3000 cities worldwide, representing nearly 40% of the world’s urban population. It also includes a global ambient (outdoor) air pollution database for every country and every corner of the world. These data contain measurements for the annual average exposure to particulate matter, PM 2.5, the tiny particles within air pollution that can penetrate the body and are most closely linked with premature death and climate change. In the past 2 years, the database - now covering 3000 cities and health burden data for nearly every country in the world - has nearly doubled in size, with more cities measuring and reporting on air pollution and levels and recognizing the associated health burden. 1. Cities like Los Angeles are geographically large. 503 mi² to be exact. One data point for the entire city isn't sufficient. The air quality in Venice Beach is not the same as the air quality in Silver Lake. 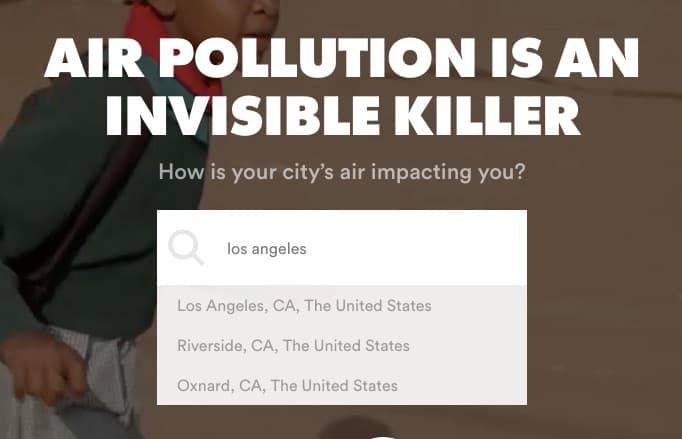 We need to collect air quality data across the city of Los Angeles and share it for everyone to access. 2. It's difficult to locate the data sources. I did a search and can't find the database with the air quality information. I could not find information on the devices used (air sensors) or how often the data is collected. 3. There are a lot of ideas around how to r﻿﻿﻿﻿educe air pollution, but it's not clear how to get involved in the data collection. The sheer amount of data that we need to collect to make it useful cannot be undertaken by one or even two organizations. It will take an army of citizens. The solution to this problem is you. In addition to conserving energy and using sustainable forms of transport, nonpartisan volunteer-driven organizations like Safecast need you to collect data. Imagine if we had data that included Venice Beach, Downtown, Silver Lake and everywhere in-between. We would be able to make better decisions at the neighborhood level which collectively would have huge impacts city-wide.